If you try shooting a snowy landscape with autoexposure, then you’ll almost always end up with gray snow in your photos. So, in this post I wrote earlier this year, I suggest a few tips for making sure that snow comes out as it should: white! If you already have a bunch of winter photos with gray snow, don’t worry: there’s a simple fix with Photoshop. Although this method works great for a lot photos, it’s still best to master the exposure when you take the shot so you get a less noisy photo. Another great thing about snow is the unique lighting conditions it creates. Reflective snow cover can actually help you get a better exposure with bird photographs, and this article written by my dad shows how. This great article by Ron Niebrugge explains how to handle your camera in the winter to prevent your batteries from running out too soon or from condensation gathering on your lens. He also has a few great tips on how to use your tripod in the snow. This article by Andre Gunther has some great tips for actually taking photos in the winter. He talks about some of the unique lighting conditions you’ll find (like the sun being much lower on the horizon), and the need for a polarizing filter to reduce glare off the snow. One of my favorite things to do for inspiration is browse Flickr photographs. It’s a great way to see the world through another person’s eyes and get new perspectives on a landscape or specific subject. So, I created this gallery of some of my favorite winter photos that I’ve found on Flickr. Just cause it’s freezing out and there’s snow on the ground that doesn’t mean you have to stay away from the trails! This site has some great tips for hiking in the winter, how to dress, and some great information on snowshoeing (something I’m planning to get into this winter season, woohoo!!). 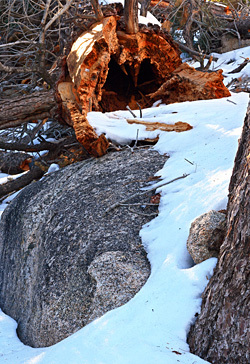 Do you have a favorite tip or resource for winter photography? If you have a great tip for taking photos in the winter, please share it by leaving a comment below! #8 Move to the southeast USA where you don’t have to deal with snow :). Great tips, Steve, thanks for sharing them. I like the Photoshop tweaks you describe to fix gray snow. Here in Palm Springs we get snow, but you don’t have to touch it because it’s up in the mountains. After it rains here in our Valley floor, there’s usually a lot of snow that can be seen in the mountains above. With that comes a stunning snow line.